Up till now, AltRider products have all come in glistening metallic splendor. 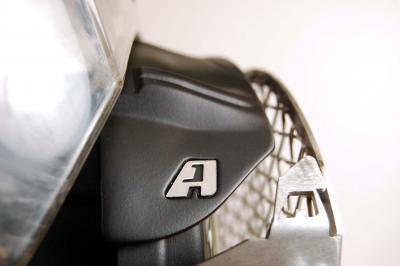 But the new AltRider Glare Guard for the BMW R 1200 GS changes everything -- it’s our first plastic part. Even though it’s made of a different material, it still shares the rugged durability that characterizes all AltRider products. I spoke to Jacob (Lead Project Engineer) and Don (Lead Industrial Designer) about the design process for the Glare Guard and how it differed from previous efforts. But the two said they enjoyed creating something in plastic. I’d say they were successful, because the Glare Guard smoothly integrates into the design of the BMW R 1200 GS and with other AltRider products, while still keeping reflected light off the windscreen during night rides. Good job, Jacob and Don! Will the Glare Guard for a 2010 GS 1200 fit when equipped with the Aeroflow fairing style windshied?